In the earliest days of digital transformation, tech companies rushed to hire as much technical talent as possible—software engineers, developers, data scientists, and more. Customers started demanding cloud solutions and more application-driven experiences. And the only way to adapt was to create an infrastructure that supported the new tech landscape. Now, 43% of available jobs in the tech industry are non-technical roles like sales and marketing as companies work to differentiate themselves. And whether you’re a value-added reseller, an integrator, or a service provider, you’re not immune to these trends. Unfortunately, digital transformation trends have made your traditional proposal-based sales process less effective. 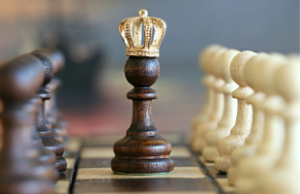 To maximize your profits, you need to embrace the new sales king—statements of work. If you look back 10 or 15 years ago, statements of work (SoWs) were almost entirely geared toward operations teams. They were cookie-cutter, contractual outlines of the systems that would be implemented and the expectations for the project. And while the operations team focused on creating detailed SoWs, you and your sales team focused on closing deals with proposals. But times have changed, and your proposals are no longer enough. 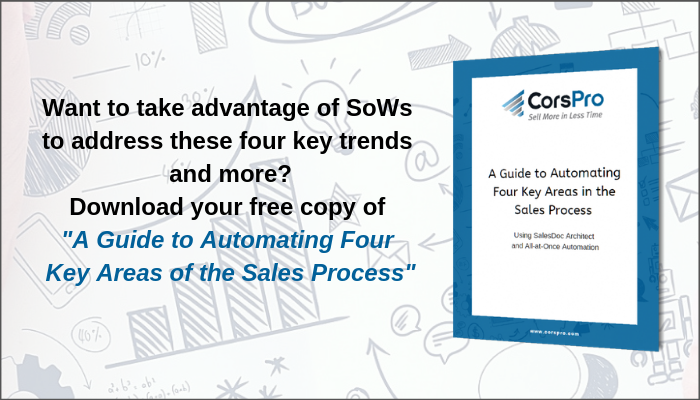 Rather than trying to force your proposal process to fit the new tech landscape, it’s time to take advantage of SoWs and address four key trends. Traditionally, SoWs explained the “what” of your project—the hardware to be installed and the timing expectations. But in a world of cloud solutions and applications, your deals are more about professional services than physical equipment. Unlike your typical proposal, a SoW dives deeper into the scope of work around the software licenses you’ll be providing. By explaining the context of your professional services, you’ll be able to differentiate your business and create a lasting impression with prospects. In the past, it wasn’t uncommon for sales teams to send 60+ page proposals for business. Prospects may have grown accustomed to bloated, unnecessary proposal templates. But in the era of digital transformation, your prospects don’t have the patience for traditional proposals. With a statement of work, you can get right down to brass tacks. It’s an opportunity to create a concise, customized document that worries less about marketing your brand and focuses more on explaining your unique approach. The faster you can show how you provide better onboarding, migration, and support services, the easier it will be to close deals. No matter the purchase, buyers are always looking for two things—to trust their vendors and reduce uncertainty. High-level proposals that focus too much on marketing often generalize the scope of your project. You might close the deal, but you’ll lose profits when the operations team experiences issues during implementation. These issues can impact margins as well as your organization’s overall profitability. A detailed SoW eliminates these concerns. You lay out the expectations for the end-to-end process—from sales to onboarding, implementation, support, and any professional services in between. When prospects understand exactly what you’re offering, you’ll earn more trust than with a traditional proposal. Profit margins were clear when deals were hardware-based. You sold $250,000 worth of equipment, had a standard implementation process, and could expect a predictable profit margin. But with professional services driving the bulk of modern software deals, it can be difficult to balance your need to exceed customer expectations with attempts to optimize profit margins. Statements of work keep the scope of any project in check. Without clear SoWs, you could make mistakes in labor or product configurations that lead to similar projects being priced differently from customer to customer. You’ll be closing deals while leaving money on the table due to erratic profit margins. Embracing statements of work instead of traditional proposals will help you address each of these trends and contribute to a more profitable business. However, creating SoWs that you can truly rely upon can be a challenge. They may take too long to deliver, improperly define the scope of a project, fail to address specific customer issues, or contain profit-killing errors. To avoid these problems, you need two things—effective discovery and automation. The key to an effective SoW is laying a strong foundation upfront. And that all starts in the discovery stage. Coming into discovery conversations with your prospects will ensure you’re delivering the correct solutions, that labor and implementation calculations are accurate, and you know which products and solutions are being added to the core offering. But discovery stages aren’t anything new. Even in traditional proposal processes, discovery was the key to making a proper handoff from your sales team to the implementation team. The problem is that discovery has become much more difficult in the wake of technology changes and the shift to professional-services-based contracts. Missteps in the discovery stage might only become clear once you’ve implemented the wrong solutions, forcing you to go back and diminish profit margins while dealing with unsatisfied customers. Rather than accepting human error and inefficiency in the discovery stage, you can create more effective statements of work by automating the process. Automated solutions ensure that every answer to your discovery questions is recorded and carried over through every stage of the contract. Don’t think of automation simply as a means to eliminate human error from your SoWs. This is an opportunity to customize statements of work according to specific customer problems. A truly customized SoW will help you stand out amongst competing proposals. And automated tools are your key to customizing at scale. If you want to learn more about creating customized SoWs that drive better profit margins than traditional proposals, we’re here to help. Contact us today for more information.